Enjoy a beautiful retreat in Muskoka. Renovated from top to bottom including a new and expanded dock! This is a four season cottage on beautiful Lake of Bays, Ontario, Canada. Large double-wide lot offers privacy and all the amenities of home. Enjoy the wooded area for adventure, or go lakeside for fun in the sun by the water - just across the road and down a flight of concrete steps. Large sliding doors and windows provide a great view of the lake from almost every room. Enjoy your morning coffee to the sound of loons at the dock, or watch the beautiful sunset before enjoying roasted marshmallows at the bonfire pit. 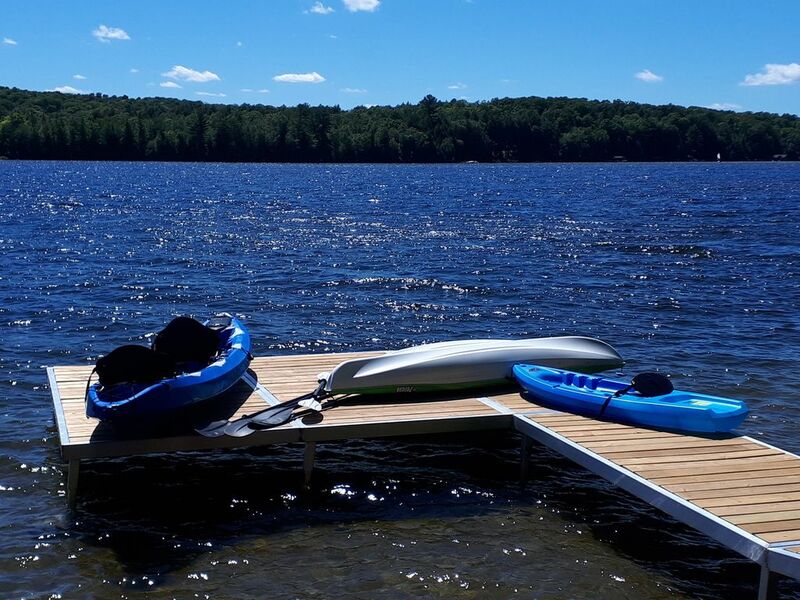 If adventure by the lake is to your liking, enjoy swimming, canoeing, kayaking, paddle boating, or a jump on the water trampoline! Or just relax outside in the screened-in swing right in your own backyard. Come in the fall and enjoy the spectacular colours of Muskoka; or in the winter to experience the crisp, fresh air. This is a snowmobiler's paradise! Skiiing, tubing, and skating can be enjoyed at nearby Deerhurst Resort, Hidden Valley Ski Resort, or Arrowhead Park. Only 15 minutes to Dorset and 25 minutes to Huntsville or Algonquin Park. 3 Bedrooms upstairs and 1 bedroom downstairs offer lots of room for friends and family to enjoy time away together. Lake of Bays is just across the road and down the cement steps to the water. Enjoy your own piece of pristine Lake of Bays. Just across the road and down the steps to a new and expanded dock. Bed sheets, pillows, comforters, and blankets are provided. 30" stainless steel, french-door, bottom mount. Additional seating for 4 at the kitchen peninsula. Many board games to choose from for hours of fun and play. Children's toys and books available in the bedroom under the stairs. Many DVD's to choose from. Wide selection for the whole family. Huge court with sand for volleyball, badminton, or digging and playing. Patio just off the living room through the double-wide sliding doors. All paddles, oars, and life preservers are provided. Very clean, modern cottage. Really nice owners, would highly recommend the cottage. Very clean, modern cottage. Really nice owners, would highly recommend staying here. Great place to spend a weekend with family and friends. It was a pleasure hosting you and your family over the holidays. Thank you for leaving the cottage so clean. We look forward to having you back. It was a wonderful place to celebrate our family Christmas! The cottage is beautiful, the location is breathtaking and the wildlife is spectacular! Stella and Greg were wonderful host, so very accommodating and provided us with all the luxuries needed! Thank you so very much! Hello Sharon, it was a pleasure to have had the opportunity to share the cottage with you and your family over Christmas. So happy you enjoyed the experience and the decorations! Thank you so much for leaving the cottage in such a pristine condition. All the best in 2019! great place to stay and very spacious. we had a good time at the cottage. We love the lake and the backyard is amazing. The entire cottage is newly renovated, it is very clean and spacious. We enjoyed our stay! So happy that you and your guests enjoyed your stay, Joe! Thank you for having such open communication - even post stay! Nice place, great dock and kitchen! It was a great spot to bring a group of friends for a birthday celebration - lots of good lakeside fun, an excellent kitchen for cooking, and very spacious interior with comfy beds. Still finalizing a bit of the renovation but it didn't really bother us. Thanks so much! Hi Scott, we were honoured to have you choose our cottage for your birthday celebration. Really happy that you enjoyed the water and the cottage amenities. Thank for being so respectful of the cottage and leaving it in such a great condition! Looking forward to having you back!